Welcome to our first HSP newsletter! 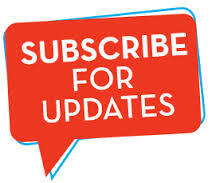 I am pleased to let you know about the Brighton HSP News, a newsletter about HSP-friendly events in Brighton or in the UK with some articles/links that can expand your understanding about high sensitivity. 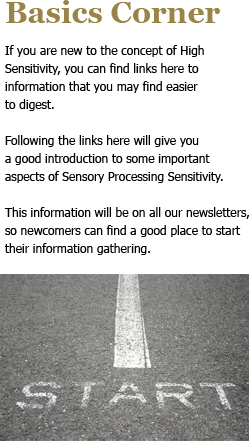 If you are new to the concept of Sensory Processing Sensitivity (or SPS - the scientific term for high sensitivity), you can check out the basics at Elaine Aron's website and our Basics Corner of this newsletter. Dr. Aron wrote the seminal book: The Highly Sensitive Person, which changed the lives of millions of HSPs already. That is a very high return for £6.49 or a trip to the library! There is just a bit of your time and energy to invest. Time and energy however are rarely small things for highly sensitives. So, you may wonder: "why should I sacrifice my precious spare time by reading yet another newsletter or a book?" I know this feeling. There is just so much information coming in these days! So, I am careful myself about what I let in, to avoid getting overwhelmed. I think I am not alone with this as an HSP - we are all familiar with the dreaded feeling of "TOO MUCH". I wouldn't write this newsletter, if I wouldn't believe that hearing about SPS can make a big difference to people. I know how it transformed my life to learn about this and keep hearing similar stories from others, as well. HSPs, who finally understand what makes them so different or parents of highly sensitive children, who understand that their "problem" child is perfectly normal, just have very different needs from the average. One of the most hurtful experience for HSPs is the sense of isolation. The feeling of not belonging to the world, which blasts non-sensitive ideals 24/7 and so loud that we can feel very alone at times with our need for something quiet and carefully formed. I am hoping to create a quiet corner here, where the balance will be different. Where you'll find out about people, thoughts, events that can resonate more with all the highly sensitive souls out there. The only thing I want to shout about perhaps is that we are not alone! Up to 15-20% of the population is highly sensitive after all - that is 9-13 million people in the UK alone! Of course, there is still an amazing variety amongst HSPs. Apart from our sensitivity, we have other aspects to our personality and life experiences that makes us all very unique. You may find it interesting to read about the HSP subcultures, and see if you recognise any of the HSP types there. What HSPs share however, is our highly sensitive nervous system. It evolved to notice and process subtle information deeply and learn more from experience. This is why I love to share information about all this. I know that it can be empowering for HSPs to have the right information about their trait. When information is right, it will fit your experience. I just encourage you to trust more what you already know about yourself (or someone else you know) deep down. Being more sensitive to events and your environment is a real mixed bag of advantages and challenges. 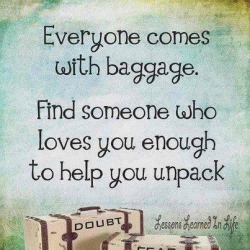 Luckily, you can learn now from our shared experiences and understanding. 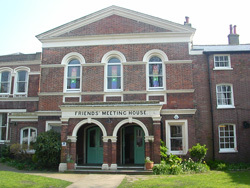 You can also meet HSPs locally, who are usually also new to all this and would like to discuss what it means to them. Feel free to bring your own questions along, if you have some. Reading this newsletter and letting others know about it can be a very small step to take towards creating a very different kind of life. Just imagine for a moment a world, where people would have more awareness about SPS. Where children would be brought up to nurture their sensitivity - as opposed to hiding it or "toughen it up" - and to learn to live a life fitting who they are, without being labelled as weird, antisocial or quirky. Where HSPs wouldn't have to struggle to survive inhospitable environments and could thrive by finding support and ways to live and work that suits them. If only, we could free up all that time and energy used up by misunderstanding and unrealistic expectations! I believe everyone - not just HSPs - would benefit from a world like that. I'll get off my soapbox now and leave you to browse at your own pace below for more news, articles and inspiration. Hope you'll enjoy what you find! Our next Meetup will be on Saturday the 20th of April 1:30-3pm. Read more about it on our Facebook page and do join our on-line community at Meetup.com, where you can RSVP. Looking forward to meeting you! We have mentioned Dr. Aron earlier, the research psychologist who introduced the concept of Sensory Processing Sensitivity. 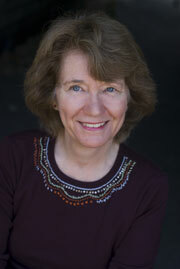 Her first book about HSPs was published nearly 20 years ago. Surprising that her work is not more in public awareness, yet. I guess, it may have to do with Dr. Aron being an introverted HSP herself, who just quietly wrote her books without making much fuss. This may sound rather familiar to all introverted HSPs - self-promotion don't seem to be our strongest point. The strong research foundation of her work however, separated SPS from the countless psychological theories that come and go all the time and the significance of her work is more and more recognised now. I would like to share with you a short video of her introducing High Sensitivity, which will be also a regular feature in our Basics Corner.